Black holes may have been abundant among the first stars in the universe, helping explain the origin of the supermassive monsters that lurk at the heart of galaxies today, researchers say. An international team of astronomers has found that black holes likely contributed at least 20 percent of the infrared cosmic background, light emitted 400 million to 800 million years after the Big Bang that created our universe 13.8 billion years ago. "It's a relief to find a possible signature of these seeds," study co-author Guenther Hasinger, director of the Institute for Astronomy at the University of Hawaii in Honolulu, told SPACE.com. Diagram of the early universe. 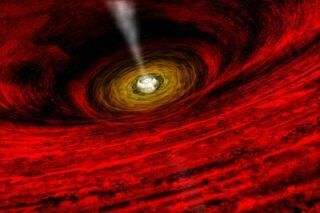 Black holes possess gravitational fields so powerful that not even light can escape. They are generally believed to form after a star dies in a gigantic explosion known as a supernova, which crushes the remaining core into a tiny but incredibly dense volume. It's unclear how black holes grow to supermassive proportions, but they can apparently do so quite rapidly. For example, some of them were apparently already well-established by 800 million years or so after the Big Bang. To learn more about the earliest stars and the first black holes, the study team analyzed X-ray and infrared signals using NASA's Chandra X-ray Observatory and Spitzer Space Telescope, respectively. The X-rays that Chandra saw likely came from matter that became superheated as it rushed into black holes, researchers said. The infrared rays Spitzer detected, on the other hand, make up the cosmic infrared background, the collective light from clusters of massive stars in the universe's first stellar generations after the Big Bang, as well as from black holes, which generate vast amounts of energy as they devour gas. The investigators focused on a region known as the Extended Groth Strip, a well-analyzed slice of sky slightly larger than the full moon in the constellation Bootes. They concentrated on spots that shone powerfully in both infrared and X-ray light. Black holes are the only plausible sources that can produce both forms of light at the intensities they looked at, scientists said. "This measurement took us some five years to complete and the results came as a great surprise to us," lead author Nico Cappelluti, an astronomer with the National Institute of Astrophysics in Bologna, Italy, and the University of Maryland, Baltimore County, said in a statement. "Our results indicate black holes are responsible for at least 20 percent of the cosmic infrared background, which indicates intense activity from black holes feeding on gas during the epoch of the first stars," co- author Alexander Kashlinsky, of NASA's Goddard Space Flight Center in Greenbelt, Md., said in a statement. These early objects could help explain the origins of supermassive black holes, researchers said, and also shed light on another puzzle from the universe's youth — a stage known as reionization. During this era between about 150 million to 800 million years after the Big Bang, radiation ionized the neutrally charged hydrogen pervading the universe to its constituent protons and electrons. "It is currently thought generally, although not unanimously, that stars were responsible for reionization," Kashlinsky told SPACE.com. "Our result indicates that black holes were a significant, potentially dominant, contributor to that process." It remains uncertain how massive these early black holes were. They could be mini-quasars containing a few tens of thousands of solar masses, born from the collapse of giant clouds of gas and dust. Or they could be micro-quasars a few hundred solar masses large spawned from massive dying stars. Mini-quasars would be heavily obscured by clouds and thus likely would not factor into reionization very much, while micro-quasars could easily pump out enough radiation to make a key contribution, Hasinger said. The Euclid mission from the European Space Agency and the eROSITA mission from Russia and Germany might be able to shed more light on these early black holes. In addition, NASA's upcoming James Webb Space Telescope might be able to see these objects individually, confirming whether they are mini-quasars or micro-quasars, Hasinger said.